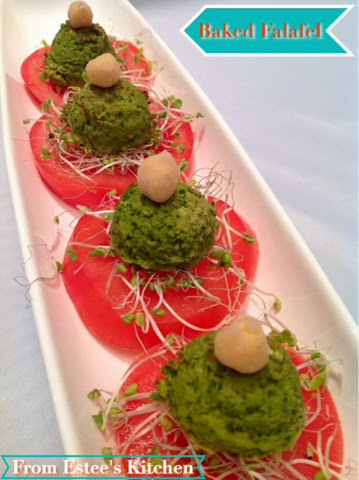 For those who like falafel, yet not the extra calories, this is a great, lighter version. I created my own version of baked falafel, though I did not compromise the taste. It is not as crispy as the fried falafel, but, in a whole wheat pita with tahini and tomatoes, it has just as good of a flavor. Low in calories and low in fat--great substitute for the real thing! In a food processor add all the ingredients and mix coarsely, or smoothly if you prefer. Take an ice cream scoop and create an evenly sized falafels. place the falafels on the baking sheet. Spray the top with olive oil and back for about 20 minutes.